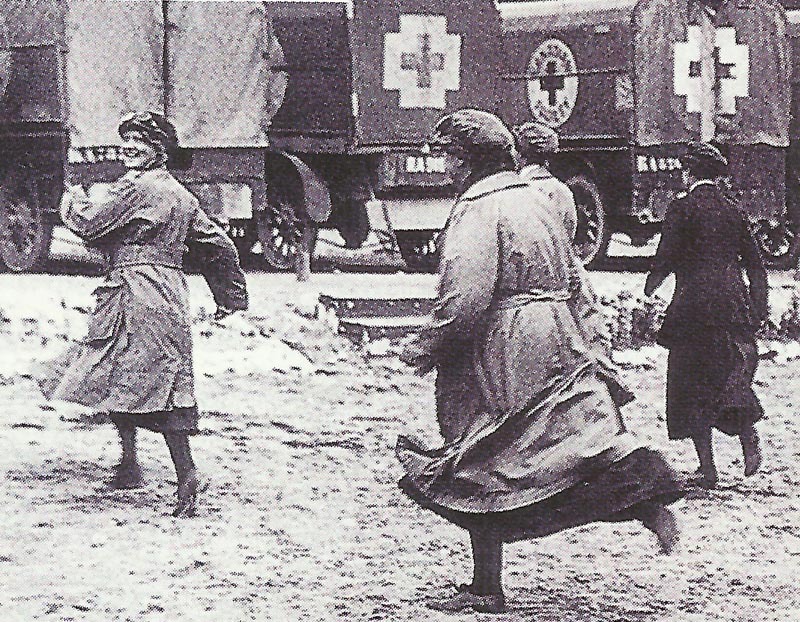 An exercise by Red Cross nurses on the Western Front. German official communiques of November 13 and 14 state nothing to report. Flanders: In Belgium effective bombardments silence German artillery batteries. Serbia: Serbs retreat on Kossovo Plain and their new temporary capital Mitrovica. They evacuate Babuna Pass east of Prilep following day. South Africa announces raising of 6 infantry battalions, 5 artillery batteries, 5 mounted regiments, all fully recruited by December 1. Adriatic: Allies begin to supply Serbia via Brindisi, Britain to provide supplies and Italian Navy to protect. Bulgaria: 2-6 RNAS aircraft bomb and damage key Ferejik rail junction (Salonika-Constantinople line; also on 16, 18, 19 November and 1 December, total of 41 bombs). Mesopotamia: Captain F Yeats-Brown (future novelist) and his pilot captured by Arabs when their Farman fails to take off after they cut telegraph line north of Baghdad.